One of the most accurate thermometers & used by the NHS. Parents will be familiar with this device! GPs , hospitals use the thermoscan 7. There are 3 versions. Thermoscan 3.5 & this one the 7. This being the best one & also the most pricey. On at boots for £50. Has excellent reviews from Boots. 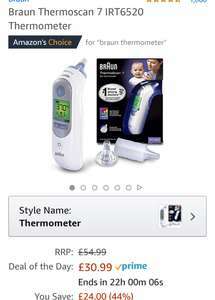 Very good for new born babies as normal thermometers can give inaccurate readings. This has age precision technology to give accurate results. 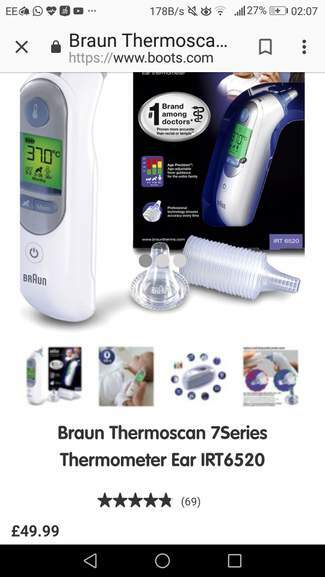 Braun’s thermometers are endorsed by GPs across Europe, and the Thermoscan 7 is one of the most popular among new parents. The clever design solves the problem of a cold thermometer tip not only being uncomfortable for baby but affecting the temperature measured; the Thermoscan 7’s flexible tip pre-warms to ensure a comfortable and accurate reading. A warning will flash up on the digital display if you haven’t positioned the tip in the right place, so you can be sure you’re using the device correctly. There are also three very useful age settings – for 0-3 months, 3-36 months and 36 months plus – because four-year-olds and newborns have different normal temperature ranges. To keep everyone’s ears clean and prevent contamination, the Thermoscan 7 comes with 21 disposable tip covers. It also comes highly recommended by parents and health professionals. This thermometer has saved my sanity during the past 6yrs and has stopped several unnecessary visits to the hospital due to high fevers from my 3 children! Worth every penny full price, but better on a deal! If its currently used by the NHS then its probably an old model with way outdated technology, NHS still use Fax machines! made me happy to hear this. Not heard of anyone mentioning the name in donkeys! Never seen a 7 all my years in the NHS. Usually the 5 (the colour code bit of the 7 isn’t necessary if you’re a Dr). This is however a great price! Firstly, I did not tell anyone not to buy it. People buy what they want. If oneday amazon sell home X-ray machines, or blood analysis kits or home defribulators... and someone is convinced they need it to keep their children safe, then fine, go buy. I understand how you feel, and respect your choice, but your talking to a parent too, and a CYP&F practitioner (well former), plus I'm not idiot when it comes to risks prevention etc. My comment did actually give an alternative, one that is, and has been used for many years (and has satisfied my needs, and millions of other families around the globe for many years). And when used in tandem with common sense, and the option to ALWAYS be able to seek medical attention via 999 if really concerned, then why would each and every parent need yet another expensive gadget in their home? Afterall, this electronic gadget offers no 100% safeguarding guarantee. Keep in mind, their are caring, loving and concerned parents, even wealthy bringing up their kids safely without a gadget for each and every event. You’re sharing a opinion by saying how did everyone manage before this. It doesn’t matter how people managed before this. It’s ur opinion and sometime you should keep it too yourself. I assume you don’t drive use a mobile or laptop/internet. Oh hang on you’re on here so you must do. How did you manage before all that. No one cares whether your opinion is that you can buy something similar for a pound. All that matters at that moment someone buys something is that it’s important to them and they feel like it will help them. Too many people on here giving a “opinion” which isn’t a opinion it’s saying not too buy it because there is a alternative. I’m the kind of parent that will tell my children it ain’t important what someone tells them they should or shouldn’t do. To ignore the people stuck in the past (like yourself) and push for different future. Just because you have had a job with kids don’t mean you know it all. I’m sorry but you just sound like a right boring person that lives by the book. Let loose live a little. The world is forever changing don’t get left behind. You’re sharing a opinion by saying how did everyone manage before this. It …You’re sharing a opinion by saying how did everyone manage before this. It doesn’t matter how people managed before this. It’s ur opinion and sometime you should keep it too yourself. I assume you don’t drive use a mobile or laptop/internet. Oh hang on you’re on here so you must do. How did you manage before all that. No one cares whether your opinion is that you can buy something similar for a pound. All that matters at that moment someone buys something is that it’s important to them and they feel like it will help them. Too many people on here giving a “opinion” which isn’t a opinion it’s saying not too buy it because there is a alternative. I’m the kind of parent that will tell my children it ain’t important what someone tells them they should or shouldn’t do. To ignore the people stuck in the past (like yourself) and push for different future. Just because you have had a job with kids don’t mean you know it all. I’m sorry but you just sound like a right boring person that lives by the book. Let loose live a little. The world is forever changing don’t get left behind. Customer returns it appears, got one and then a replacement, both had been opened and were marked.